Game breakdown: Mercedes Riggs might be the shortest player on head coach Joanne P. McCallie’s roster this year but she definitely shows her fight and tenacity on the court. After two years at Salt Lake Community College—where she earned second-team All-America honors and was given the Best Defensive Player award as a freshman—the Lindon, Utah, native transferred to Duke a year ago. The senior guard played 32 games in her first year as a Blue Devil but only started in two of them and saw only 13 minutes per contest. Riggs appeared to have trouble adjusting to the additional physicality at the NCAA level and the transition remains a work in progress for the guard. 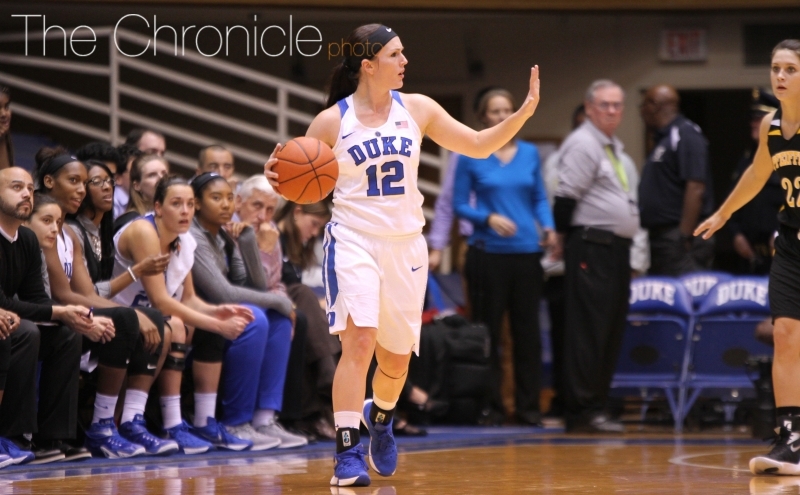 Riggs scored the majority of her points from beyond the arc, converting 15 of her 54 three-point attempts. Defensively, Riggs’ physicality and aggressiveness are crucial aspects of her game and allow her to make life tough on opponents. Role on the team: After Duke brought in five highly-touted freshman guards this offseason—two of which ranked top-10 overall in the incoming class—Riggs might see limited playing time again this season. In the first two exhibition games of the year, the veteran guard averaged a team-low nine minutes per game, but still contributed by delivering three assists and a steal. Although she hasn’t been in Durham long, Riggs is effectively one of the veterans on the young team and the gritty guard will look to share her experience and leadership on and off the court with a talented but young Blue Devil squad. Riggs will certainly prove to be a worthy challenger for freshman to go up against in practice as the 5-foot-7 floor general doesn’t back down one inch from competition.